The teachers of our college are attending training courses on regular basis as per schedules of CME, Mohakhali, Dhaka. As part of the continued medical education, different departments are regularly organizing seminars involving faculties and students on different academic and concurrent issues. 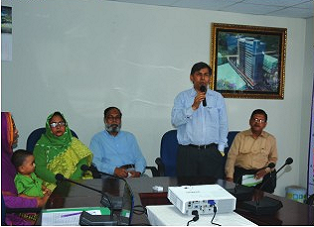 Prof. Liaquat Ali, Vice Chancellor of Bangladesh University of Health Science (BUHS) presented a lecture on 'Why Should We prioritize Biomedical Research' on 19.06.2014. In December 2014 Mr. Mahmud Hasan, MBE, Chief Executive of APASEN international presented a lecture on 'Understanding Learning Disabilities. He is a renowned activist and philanthropist in rehabilitation of persons with learning disabilities. In May 2015 Dr. Aboo Nasar, President of World Health Academy (WHA), USA and Mr. Edwin Giles vice-President of WHA presented paper on 'Age of personalize Medicine: a New Era'. Ibn Sina's attractive meeting rooms are being used as a hub for meetings of different specialized societies of Bangladeshi Doctors. 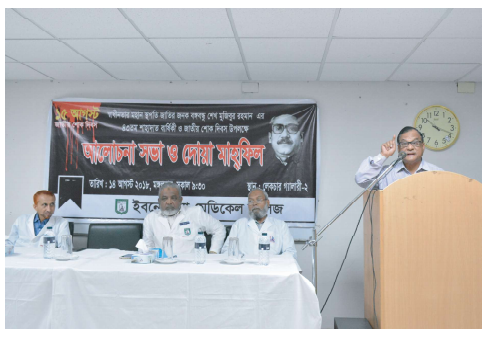 In 19th August 2015 'Bangladesh Society of Medical Biochemists (BSMB)' arranged its pre AGM 'Executive Committee' meeting and seminar in the conference lounge of ISMC. Prof. Liaquat Ali, Vice Chancellor of Bangladesh University of Health Science (BUHS) and president of BSMB presided over the meeting. Dr. Syeda Fahmida Afrin presented a scientific paper in the seminar. 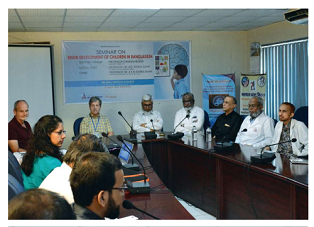 On 22 March 2016, a seminar was held in Ibn Sina Medical Collage on 'Current Situation of zika virus'. Prof. Abdus Sobur head of the department of medicine of ISMC, Presided this program. A seminar & a workshop about child friendly Hospital jointly organized by Breast Feeding Foundation and Ibn Sina Medical College on 28 May to 31 May, 2016 in the seminar room Ibn Sina Medical College. About 50 participants attended this program. Dr. Shariful Islam, Research Asstt. Dept. of Paediatrics, University of Illinois, Chicagoon "Collaboration and exchange programmes with University of Illinois." Prof. A.N.M. Zia-Ur Rahman, Principal, Ibn Sina Medical College presided this program & conducted by Prof. Abu Kholdun Al Mahmood on 12 July, 2016. 4th CME : Live workshop sawbone Demonstration & Instructional course on �Total Hip and knee Replacement surgery� was held on 22 July, 2017, Presided by Dr. A K M Sadrul Islam, Chief guest was Prof. Dr. Qazi Shahidul Alam, Ex-Prof. NITOR, director IBBL. Special guest of this program was Prof. Dr. A N M Ziur Rahman, Principal, Ibn Sina Medical College. Guest of honour was Dr. Sudipta Mukharjee, seniour Cons. Orthopedics, Peerless Hospital, India.